Stockport railway station still maintains its Victorian grandeur though has been suitably modernised in recent years. It even now has platform zero which sounds weird, but is the result of adding a new platform and not renumbering the other platforms. 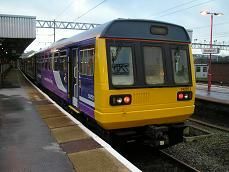 I am getting the rarest train in Britain, which only runs once a week and only goes in one direction from Stockport to Stalybridge via Guide Bridge through east Manchester. It is known as a parliamentary train and is a method of the train companies keeping the line open rather than going through the rigmarole of the closing down the line process. It used to run on a Saturday morning, which meant that more people would use it, but since December 2008 it has been switched to a Fridays only schedule - known only by a few select locals and some railway enthusiasts. It leaves from platform 3 of Stockport station at 09.22. The train arrives on time but the guard isn't letting us on. We are then told that it is going to be moved to a different platform as it is waiting for a different driver. It goes out and then comes back into platform 3a, a bay platform. There are three passengers including me, waiting and eventually we are allowed to get on, but we are waiting until 10 o'clock before the driver appears! We eventually leave at 10.06, around ¾ hour late and go straight out onto the large viaduct, which goes over the town of Stockport and the M60 motorway. But we come to a stop, as we have to wait for a signal so we can leave the mainline and go onto the branch line. We soon do that and then go past a school on the right and what used to be the old Jubilee sidings, only going about 20 mph. Then we stop again at a red light for five minutes. It is to let two Freightliner Class 66's past, as the line is used by some freight workings, avoiding the centre of Manchester. Then we move off again, going onto the single track and past some allotments on the right. We then slow for Reddish South station, which was once an island platform, but has just the one platform in use. It has two station signs and nothing else. We do the statutory stop but no one is there of course. If they were waiting they would have given up ages ago, thinking the train was cancelled. As we move away you can see that the track was once four tracks wide here and sadly much of this has been covered by Silver Birch trees which seem to grow quickly where there was once railway track. We speed up to about 40 mph and go over the Manchester Piccadilly to Marple and Sheffield line. There is now some open countryside on the right, but still plenty of housing on the left. We cross over the busy M60 motorway below us and then pass under the M67 motorway, a motorway that was supposed to go over the Pennines to Sheffield, but only got as far as Mottram in Longendale. We come into Denton station, which like Reddish South is an island platform station, but does have two tracks. The only problem is that the station signs are pointing the other way to a platform where trains do not stop. We go into a cutting passing a factory on the right and the large Audenshaw reservoirs on the left. A freight line (two tracks) then goes off on our left, to join up with the Manchester Victoria to Stalybridge line. We are now going about 30 mph as houses appear once more on the left, and then we join up with the line to Hadfield joining us on the left. We then arrive at Guide Bridge station, but on the up platform, where the station sign says the next train is for Manchester Piccadilly! Luckily none of the waiting passengers get on and we move away past a signal box on our right, before leaving the Glossop-Hadfield line and turning northeastwards. We pass the remains of once substantial sidings on our right and some more sidings on the left, with track maintenance vehicles stabled there. We go over the Cheshire Canal, with Dunkinfield on our right and Ashton Under Lyne on our left. It's typical Lowry type industrial scenery of old mills and terraced housing. The track veers to the right as we move into a cutting and then join up with the main line from Manchester to Leeds on our left before we slow and stop at Stalybridge station. We pull into the bay platform and all three of us get off, after the guard has apologised to us for its late arrival. Apparently the driver had come into Manchester Piccadilly on a train from Chester and got on a train that said it was going to Stockport. In fact the sign was wrong and he and several passengers ended up on a Manchester Airport train and had to get off at the first stop and come back into Manchester, thus delaying our departure from Stockport! We actually arrived at Stalybridge at 10.35, meaning that I missed my connecting train back to Manchester Victoria and had to put my schedule back by one hour. At one stage at Stockport I was thinking of abandoning the trip and getting on a train into Manchester, but I'm glad I didn't, getting a chance to travel on the rarest passenger train in Britain. Incidentally the station bar at Stalybridge station is a must-visit if you have time. It's full of railway memorabilia and serves many rare real ales. The train then left the station and apparently went to Newton Heath sidings.